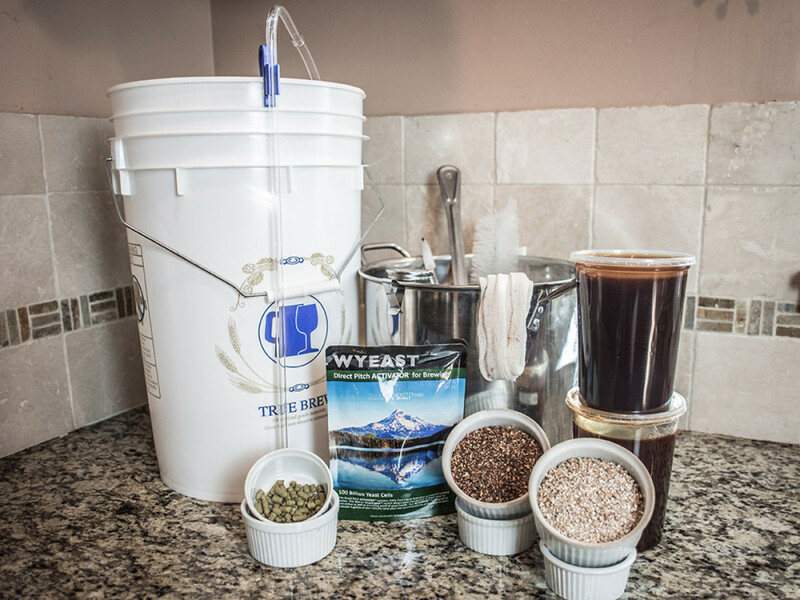 In this homebrewing tutorial we take the all-extract brewing process to the next step by incorporating the use of specialty grains, such as crystal or chocolate malt, to add complexity and color to a homebrew recipe. 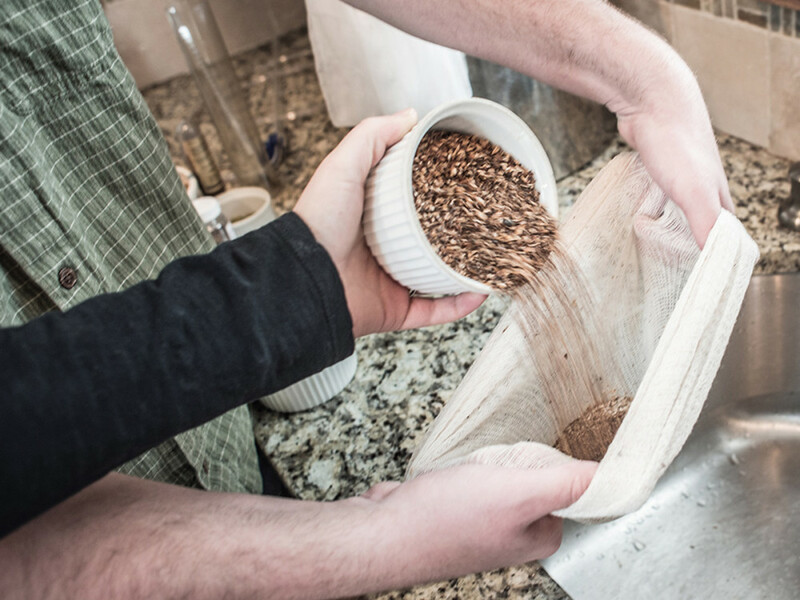 This process requires minimal equipment and only one additional step compared to extract brewing, while allowing the homebrewer to get familiar with incorporating grains into their brew day. 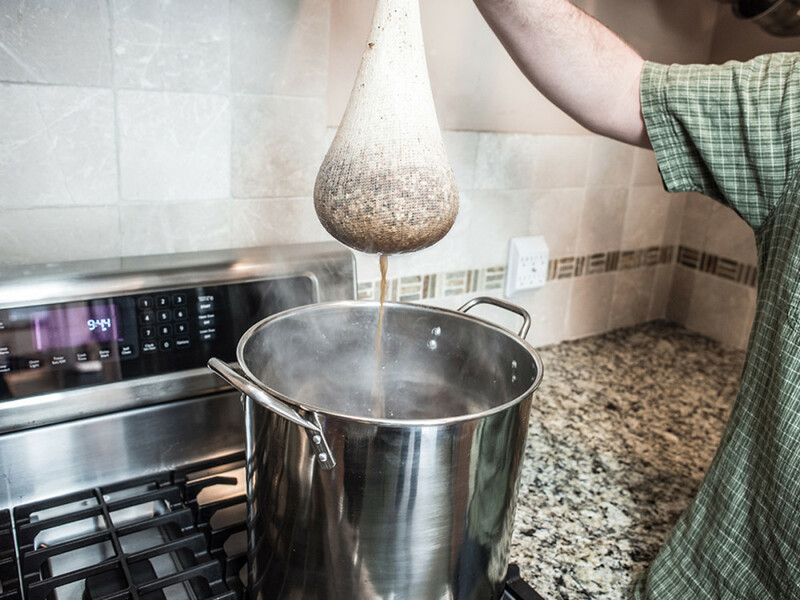 Extract with specialty grains homebrewing is ideal for the all-extract brewer looking to take the next step into grains, or any level of homebrewer working within time, space, or budget constraints. 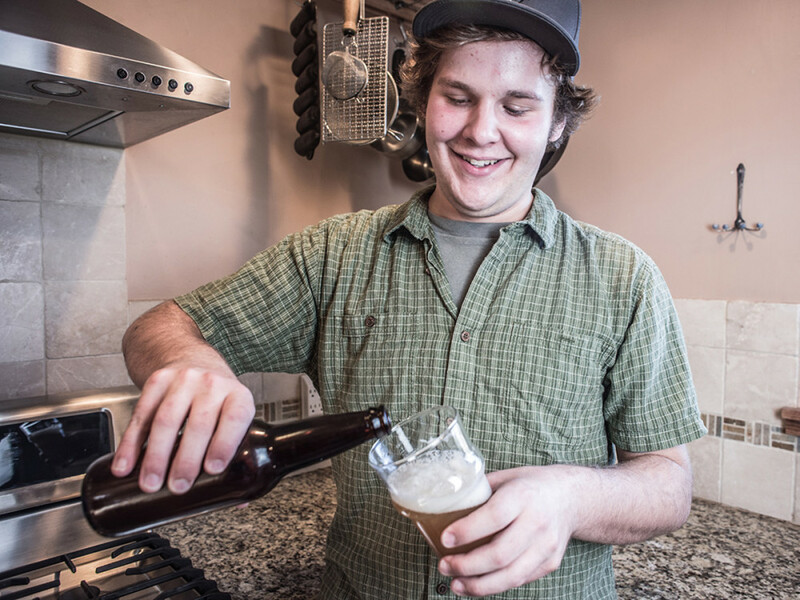 For more in depth information on making beer at home, grab a copy of How To Brew: Everything You Need to Know to Brew Great Beer Every Time (Fourth Edition) by John Palmer. 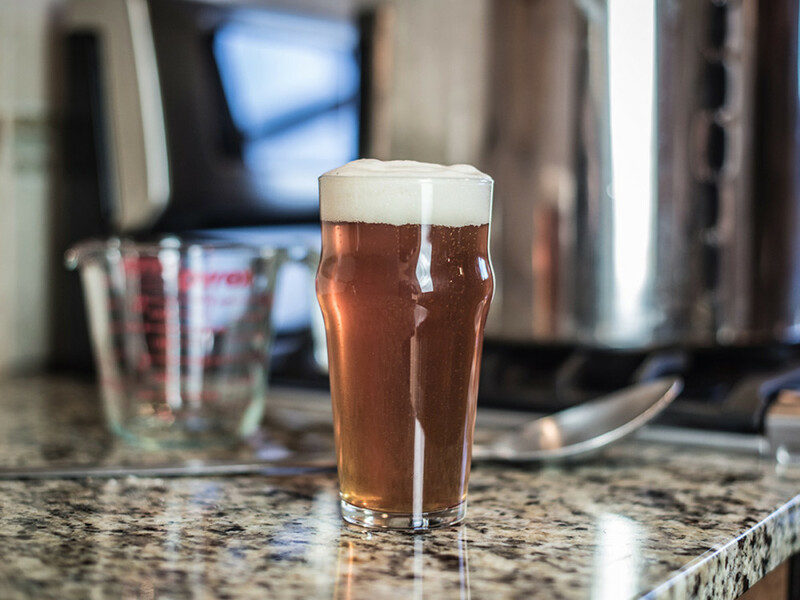 Read through the homebrew recipe and steps of the brewing process entirely before starting your brew day to ensure maximum efficiency. This tutorial will walk you through the entire brewing process for Victory and Chaos IPA, an English India pale ale. 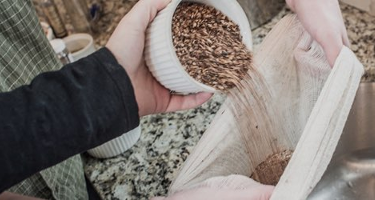 The same steps can be applied to any extract with specialty grains recipe, although instructions for other beer styles and fermentation and packaging processes will vary. 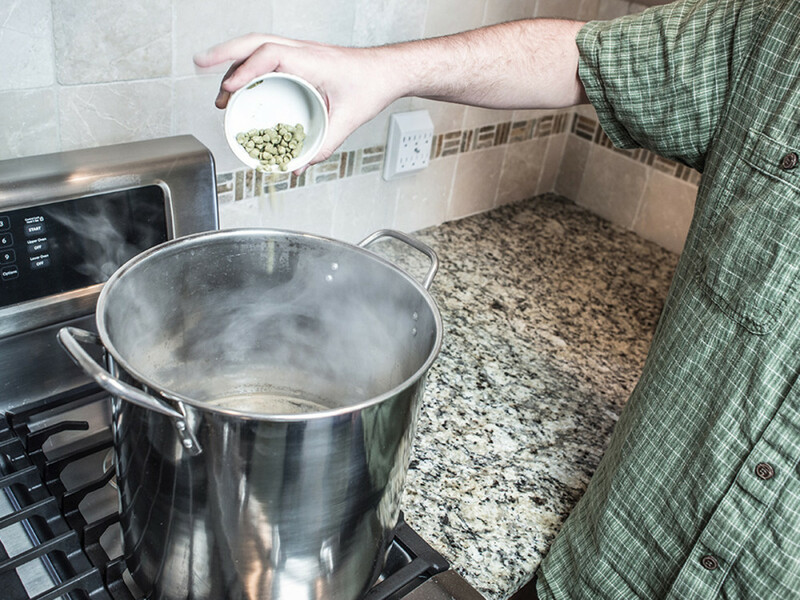 Ensure you have all the homebrewing equipment and beer ingredients necessary to brew. Using unscented cleanser, thoroughly clean all brewing equipment. Debris on equipment can harbor microorganisms that can spoil a batch of beer, even with proper sanitation. 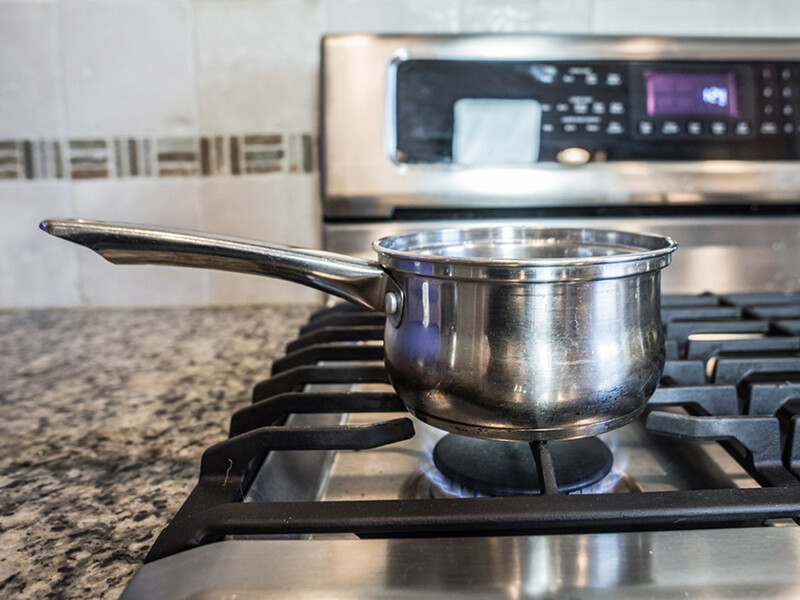 Put 3 gallons (11.4 L) of water in the boil pot and heat to 160°F (71°C) give or take 10°F. 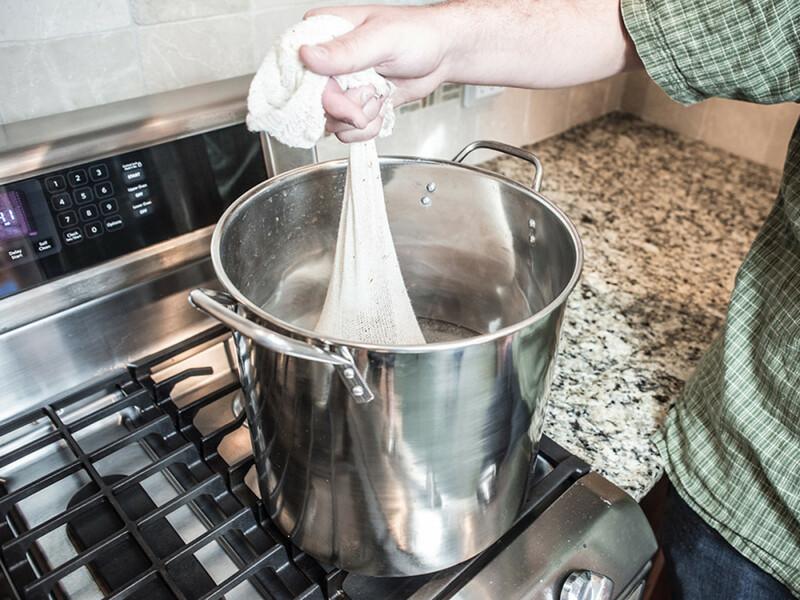 While the water is heating, put the specialty grains into a grain bag and tie off the ends so the grains can’t escape. 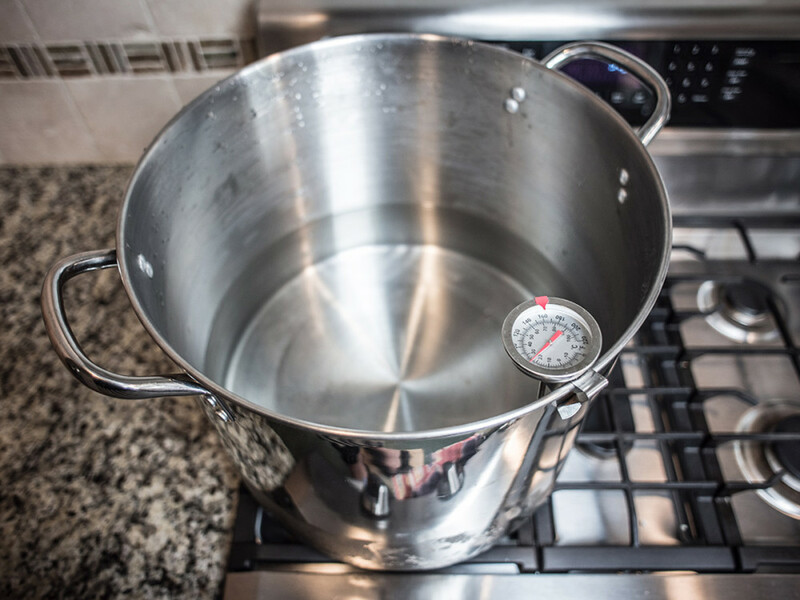 Once the water has reached 150-170°F (65.6-76.7°C), immerse the grain bag in the water for 30 minutes. Dunk and swirl the grain bag like you would a large tea bag, ensuring the grains are completely saturated. Cover the pot. 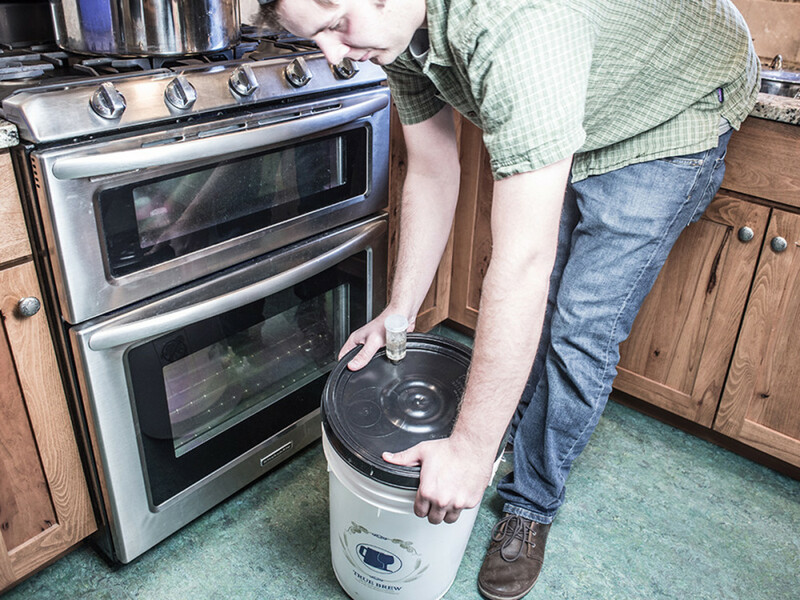 Maintaining exact temperatures during the steeping of specialty grains is not essential. After 30 minutes, remove the grain bag and let it drip until it stops. Squeezing or wringing of the grain bag is not typically recommended. Add half the malt extract called for in the recipe. 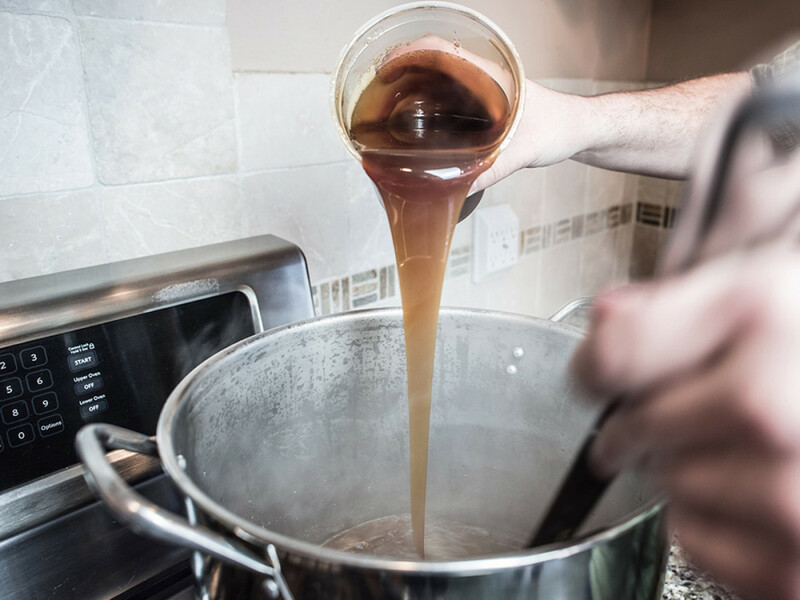 Stir until fully dissolved, being careful not to allow the malt extract to clump or collect on the bottom of the boil pot. Return the liquid to a rolling boil. As soon as the liquid reaches a rolling boil, add the 60 minute bittering hop addition. After 45 more minutes, add the 15 minute hop addition. After 10 more minutes, add the 5 minute hop addition. Note: hop additions are typically labeled with the time from the end of the boil. 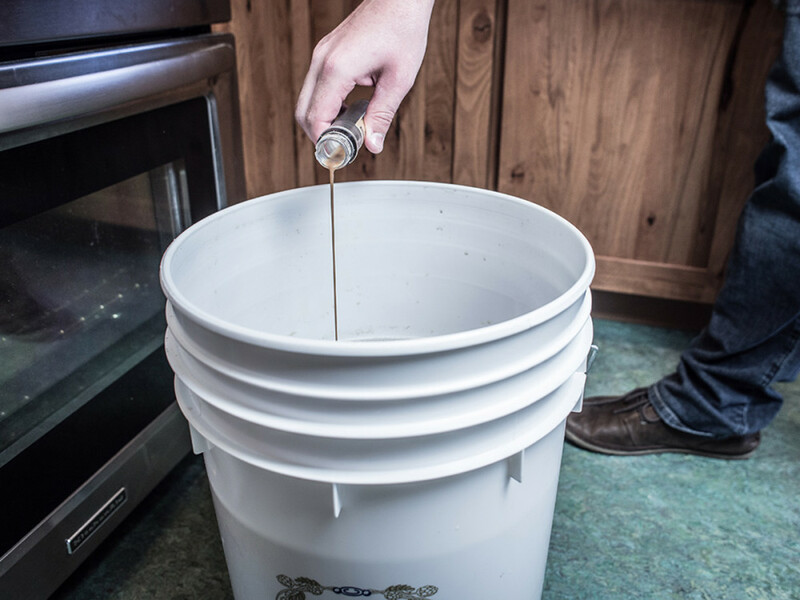 After the 60 minute boil is complete, turn off the heat and stir in the remaining liquid malt extract until completely dissolved. 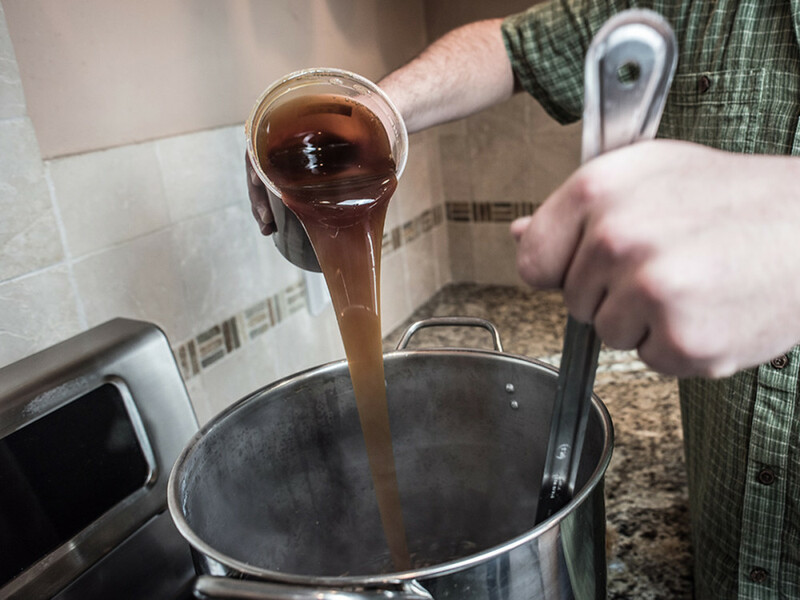 Everything that comes into contact with the wort after the boil must be sanitized in order to prevent any risk of infection that could spoil a batch of beer. 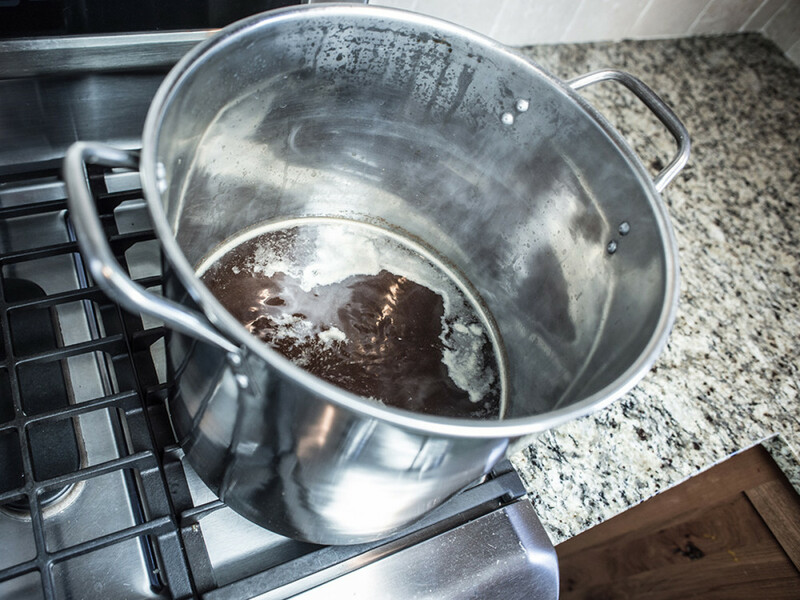 After the 60 minute boil is complete, chill the wort as fast as possible to 70°F (21°C) using an ice water bath. 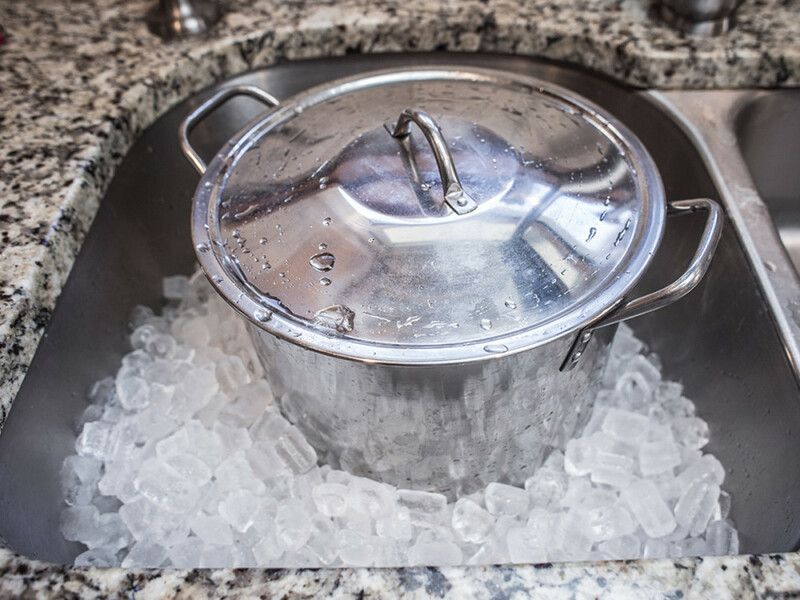 Be careful not to let any outside water get into the pot which could contaminate the beer. 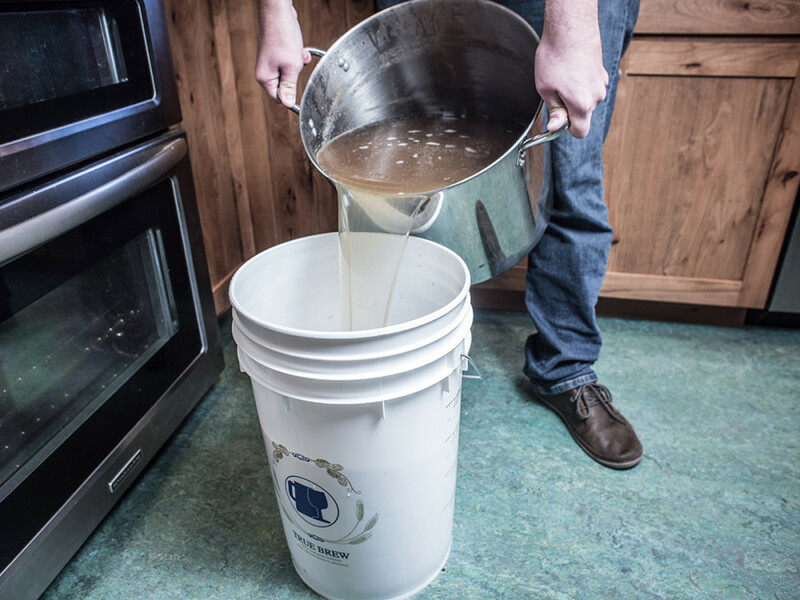 Using clean and sanitized equipment, such as an auto-siphon or racking cane, transfer (rack) the wort into a clean and sanitized fermenter. 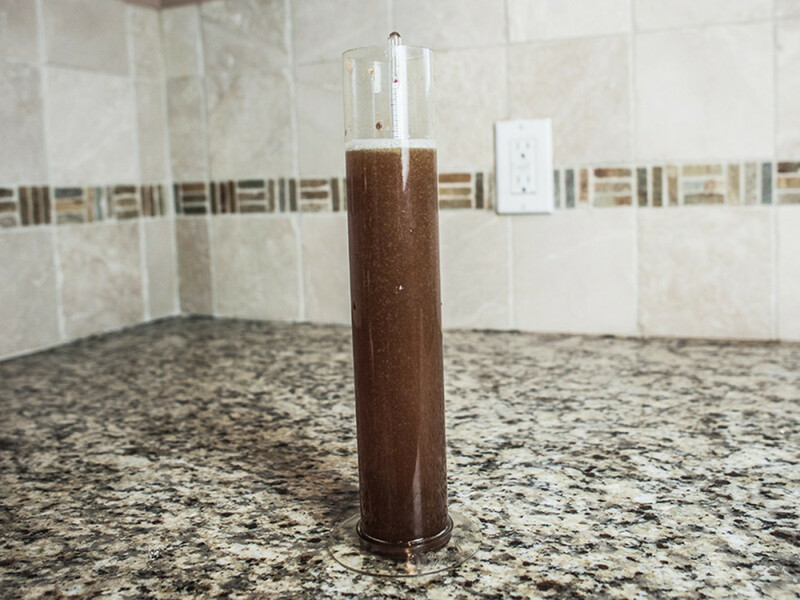 Using a clean and sanitized cup or wine thief, pull a sample of wort large enough to take a hydrometer reading. This reading is your Original Gravity. It is not recommended to return the sample to the batch of beer due to risk of contamination. 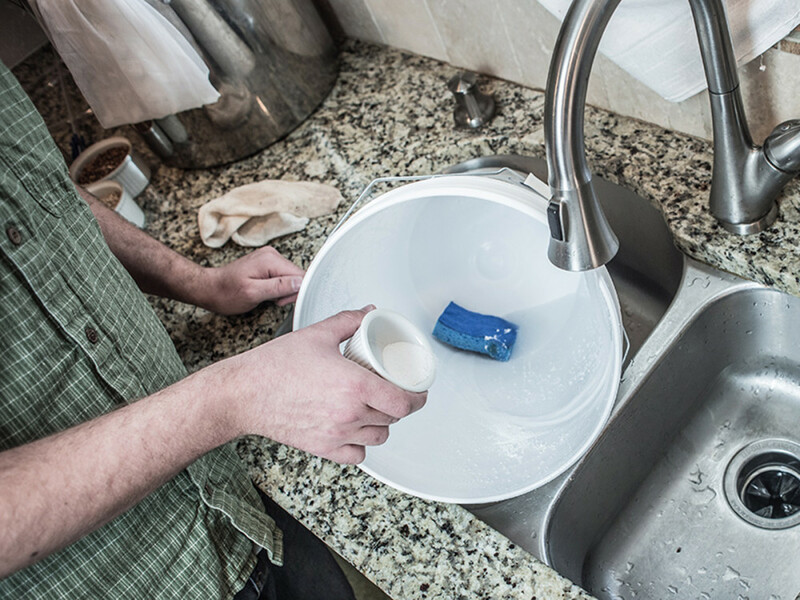 If you must return the sample, make sure the hydrometer and the vessel holding the sample are thoroughly cleaned and sanitized prior to testing. 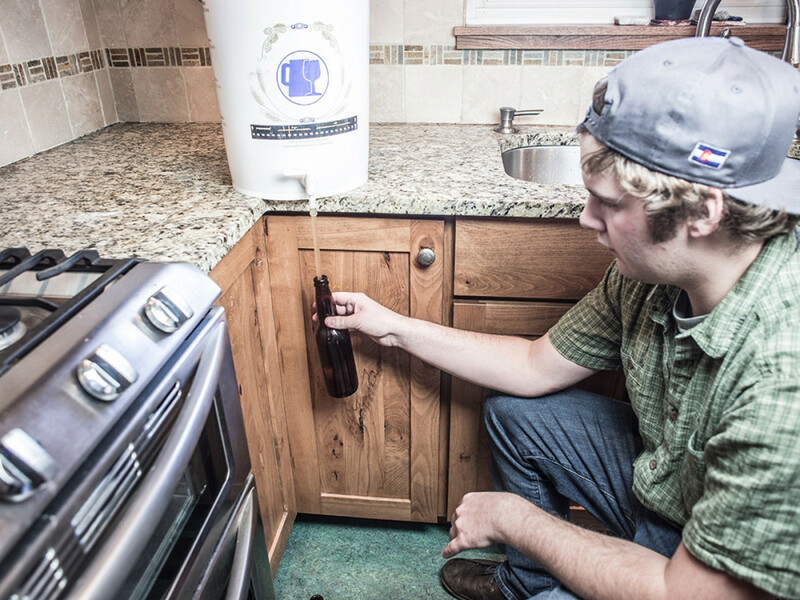 Sanitize your yeast container and pitch the yeast into the fermenter. Note: If using a Wyeast smack pack, it is advised to activate the yeast at least 2-3 hours before pitching into the fermenter. 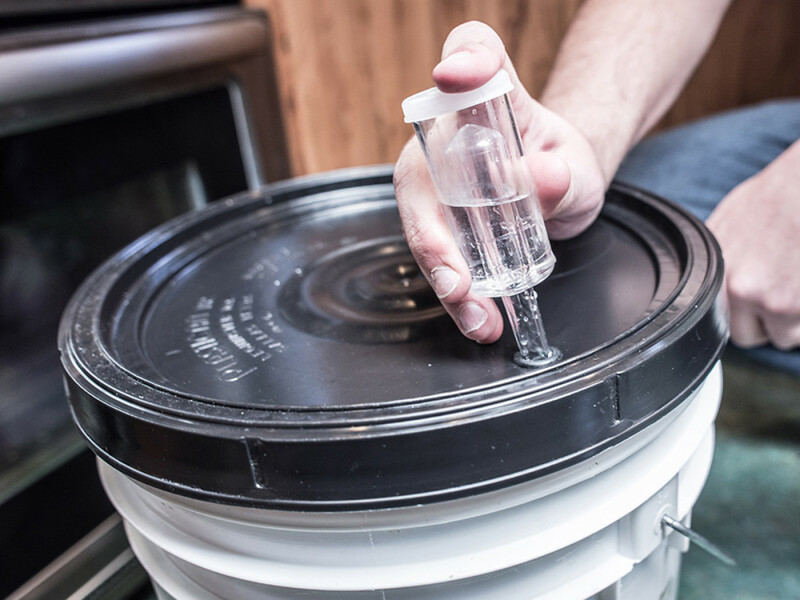 Seal the fermenter with a clean and sanitized airlock and bung. 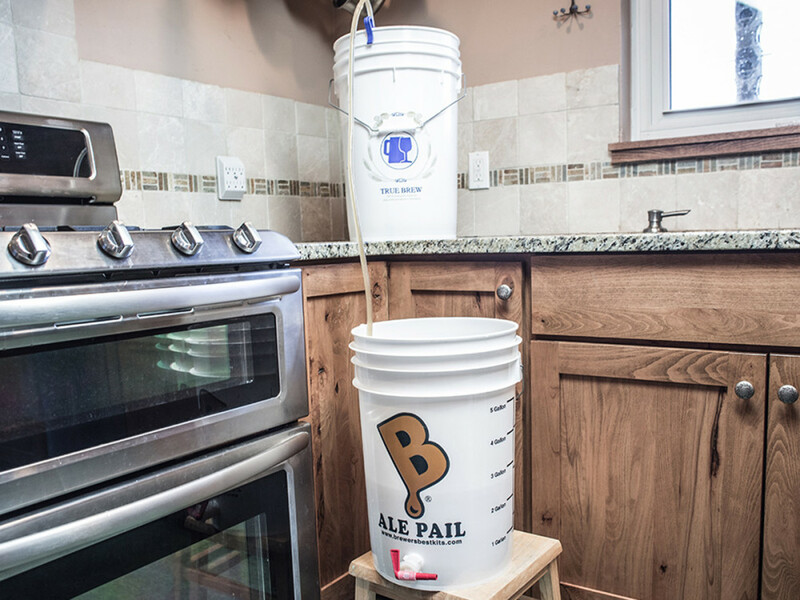 If using a bucket, a carboy bung is not typically needed. Once the fermenter is sealed, give it a shake for a minute or two to provide oxygen which is vital to yeast cell growth and quality fermentation. After that, prevent the liquid from splashing as much as possible until the beer is enjoyed. For the next 1-2 weeks, the yeast will be fermenting the wort into beer. Store the fermenter in a location that can maintain the desired fermentation temperature (65°F; 18.3°C) with minimal disturbance and protection from light. Splashing the wort after the initial pitching of the yeast can instill flaws in the final product. 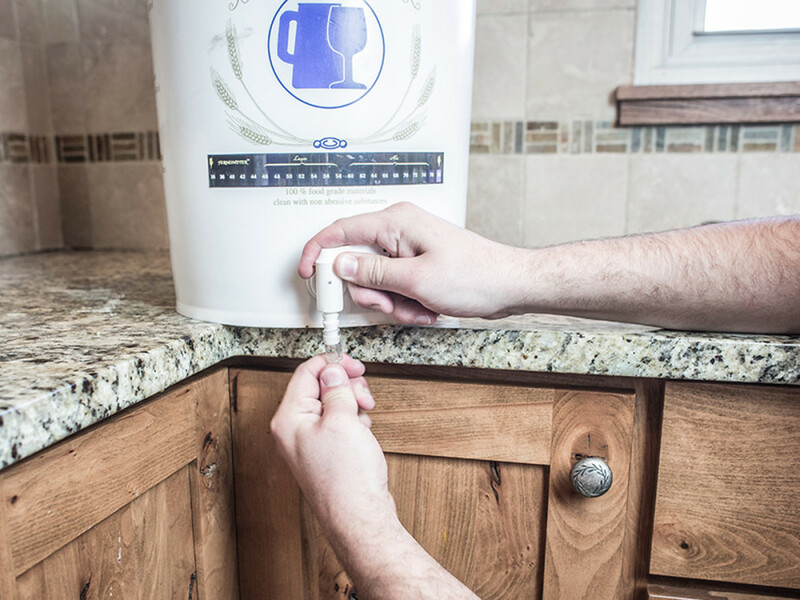 Generally speaking, beer is ready to be bottled after 2-4 weeks of fermentation, but homebrewers are encouraged to take hydrometer readings. Once gravity readings have stabilized over the course of a few days, it is safe to assume the beer can be primed and bottled. Keep in mind opening a fermenter and taking samples introduces risk of contamination, so practice good cleaning and sanitization. 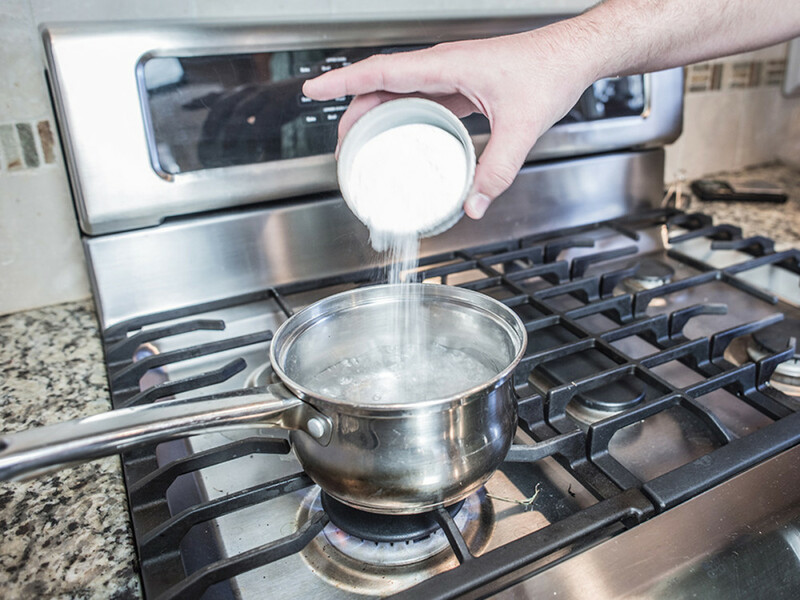 Once boiling, add 4-5 ounces (113.4-141.7 g) of priming sugar (dextrose), and boil for 10 minutes. 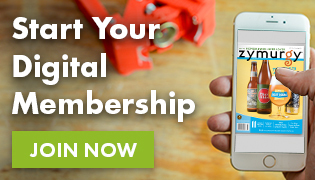 If dealing with less than 5 gallons, you may want to use the Bottle Priming Calculator, or scale down the amount proportionately based on the volume at bottling. 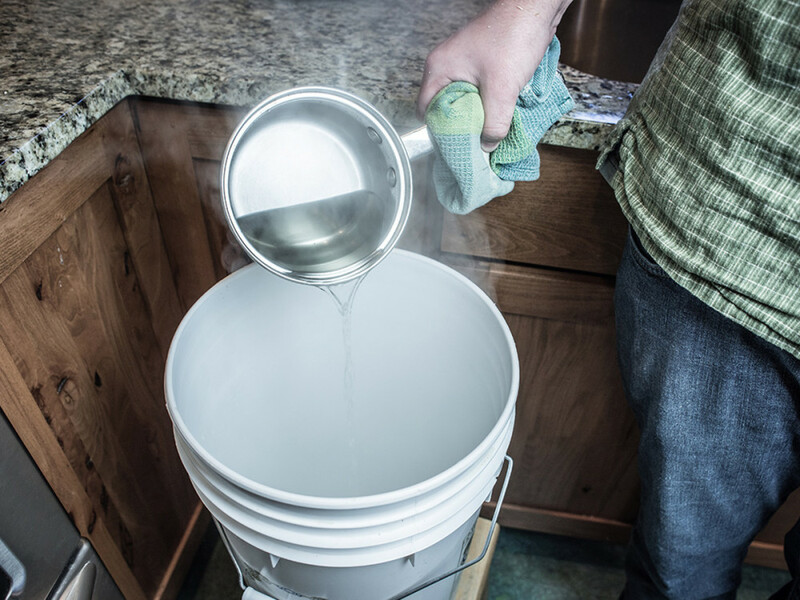 After 10 minutes, remove the priming sugar solution from the heat and add it to your already clean and sanitized bottling bucket. 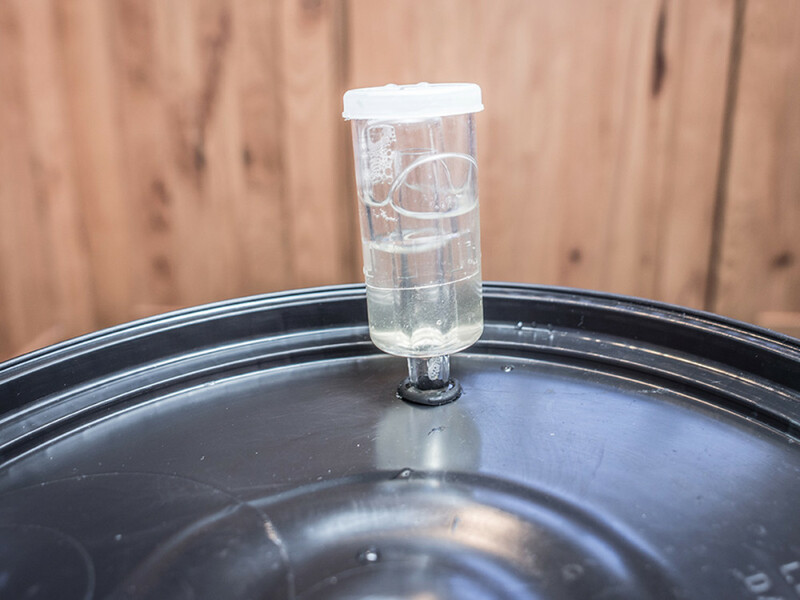 Using clean and sanitized equipment, such as an auto-siphon, rack the beer from the fermenter into the bottling bucket, trying to avoid splashing. Get the liquid to whirlpool in the bottling bucket in order to evenly mix the sugar without splashing. 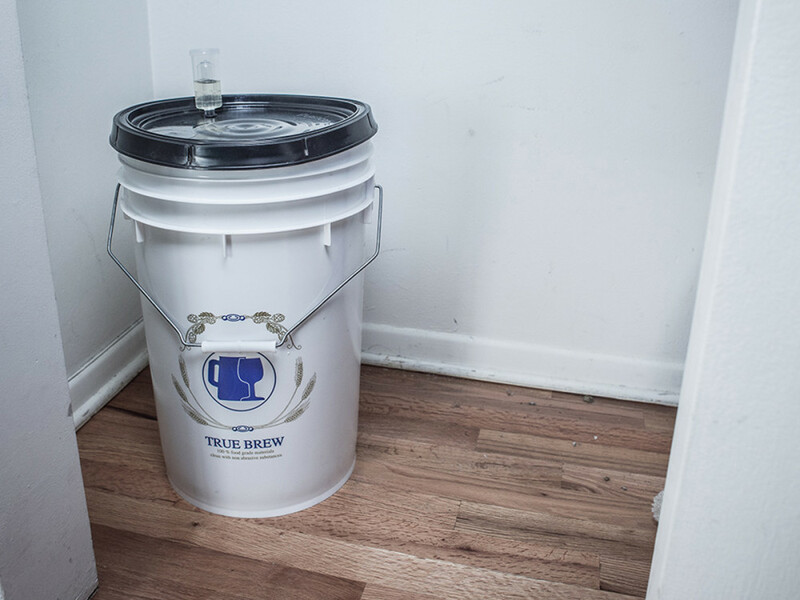 Avoid transferring the solid contents at the bottom of the fermenter (trub) into the bottling bucket. 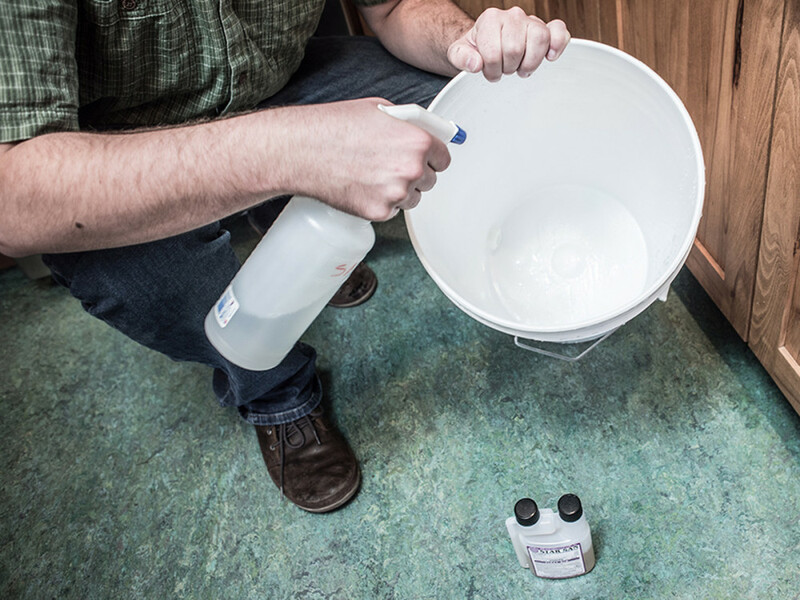 Attach the clean and sanitized bottle filler to the spigot of your clean and sanitized bottling bucket with a small piece of clean and sanitized food-grade tubing. When you remove the bottle filler, the volume should be perfect and consistent from bottle to bottle. 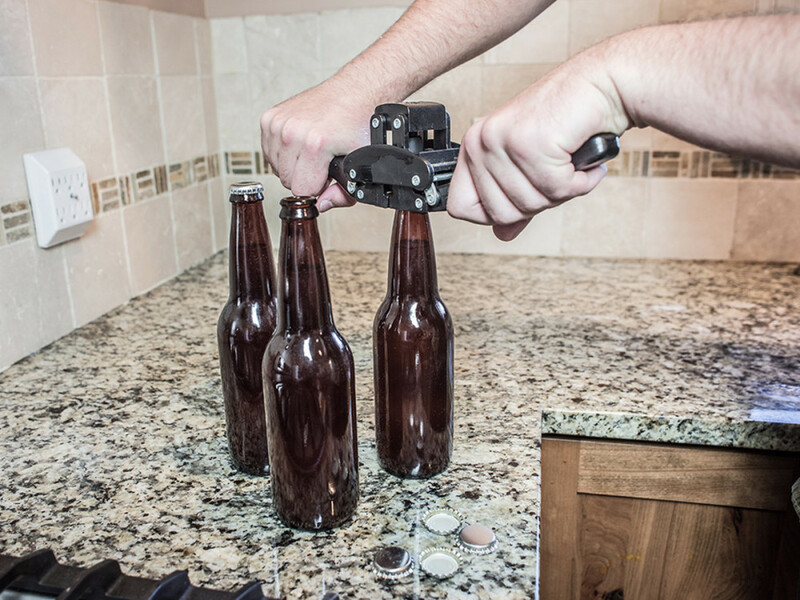 Carefully cap bottles securely with sanitized caps using a clean and sanitized capper. 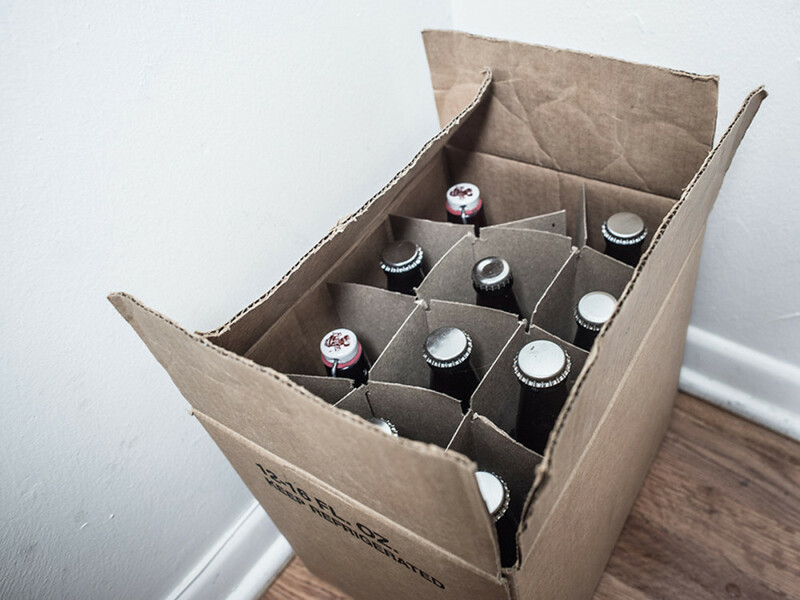 Place bottles in a room-temperature area, around 70°F (21.1°C), and let sit to allow carbonation.